There are many SPG who dress un-accordingly to the teachings of Islam when they are running product promoton actvites. This study uses qualitatve research method with a phenomenological approach. Subjectsin this study were women who worked as SPG, while the research object was in Semarang City. The results of this study indicates that the use of Sales Promoton Girl is potental to violate Islamic Sharia because of theinadequacy of the clothes used by SPG, since in the marketng system, the clothes used by Sales Promoton Girl are considerate un-accordingly to the provisions of the islamic sharia or not in accordance with the Islamic perspective. Agow, O. (2017). Perilaku Sales Promotion Girl (SPG) di Kota Manado. Jurnal HOLISTIK, Tahun X No. 19, (19), 1–22. Alvo, M., & Hasan, I. (2017). Strategi Komunikasi SPG Rokok Lucky Strike Mild Dalam meningkatkan omzet penjualan PT. Bentoel Internasional Investama Perwakilan Banda Aceh. Jurnal Ilmiah Mahasiswa FISIP Unsyiah, 2, 1–11. Arfryani, L. (2016). Konstruksi Makna Mahasiswi Sebagai SPG (Sales Promotion Girl) Freelance di Kota Pekanbaru. JOM FISIP, 3(1), 1–12. Assauri, S. (2013). Manajemen Pemasaran. Jakarta: Rajawali Pers. Chaer, A. (2007). Linguistik Umum. Jakarta: Penerbit Cipta. Khasmir. (2004). Pemasaran Bank. Jakarta: Prenada Media Grup. Kotler, & Keller, K. L. (2013). Manajemen Pemasaran. Jilid 1, Edisi 13, Erlangga. https://doi.org/10.1080/08911760903022556. Lestari, nur A. (2012). Eksploitasi pada perempuan. Jurnal Komunitas, 4(2), 139–147. Makmun, S. (2015). Sensual Marketing (Memasarkan Produk Dengan Menggunakan Jasa Sales Promotion Girls) Menurut Perspektif Ekonomi Islam. Universitas Islam Negeri Walisongo. Manshur, A. Q. (2012). Buku pintar Fikih Wanita. (Y. Burhanudin, Ed.) (cetakan 1). Jakarta: Zaman. Mendez, M., Bendixen, M., Abratt, R., Yurova, Y., & O’Leary, B. (2015). Sales Promotion and Brand Loyalty : Some New Insights. International Journal of Education and Social Science. Mochammad, N. (2008). Investasi Syariah. (Jusmaliani, Ed.). Yogyakarta: Kreasi Wacana. Moleong, L. (2006). Metodologi penelitian Kualitatif. Jakarta: Kualitalif Sasial. Mutiara, R. D. (2013). Perilaku Komunikasi Sales Promotion Girl Provider Xl Axiata. Artikel. Nurcholifah, I. (2014). Strategi Marketing Mix Dalam Perspektif Syariah. Jurnal Khatulistiwa-Journal Of Islamic Studies. Rafikah, Noer. (2014). Analisis pengaruh penggunaan jasa event organizer dan sales promotion girl terhadap keputusan pembelian rokok apache. Unisla Journal. 12(3), 1-6. Oyeniyi, O. (2011). Sales Promotion and Consumer Loyalty: A Study of Nigerian Tecommunication Industry. Journal of Competitiveness. Rafikah, N. (2014). Sales Promotion Girl Terhadap Keputusan Pembelian. Unisla Journal, 12(3), 1–6. Raharti, M. (2001). Manajemen Penjualan dan Pemasaran. Yogyakarta: Andi Offset. Retnasih, R. (2001). Sales Promotion Girls dalam Berbagai Perspektif. Jakarta: Salemba Empat. Rivai, V. (2011). Islamic Marketing. Jakarta: PT Gramedia Pustaka Utama. Samsudin., N. V. (2013). Eksploitasi Tubuh Sales Promotion Girl (SPG) Rokok Nicke Virawati Samsudin Arief Sudrajat. Fakultas Ilmu Sosial Universitas Negeri Surabaya, Volume 01, 1–5. Sari, F. A. (2014). Persepsi Masyarakat Terhadap Sales Promotion Girl Otomotif (pp. 1–17). UNS. Tamamudin. (2014). Refleksi Teori Pemasaran... (Tamamudin). Jurnal Hukum Islam (JHI) Volume 12, Nomor 2, Desember, 2014 Http://E-Journal.Stain-Pekalongan.Ac.Id/Index.Php/Jhi, 12, 273–285. ADITYA, Fajar. The Marketing Strategy of the Product with Sensual Marketing Reviewed from Islamic Perspective. 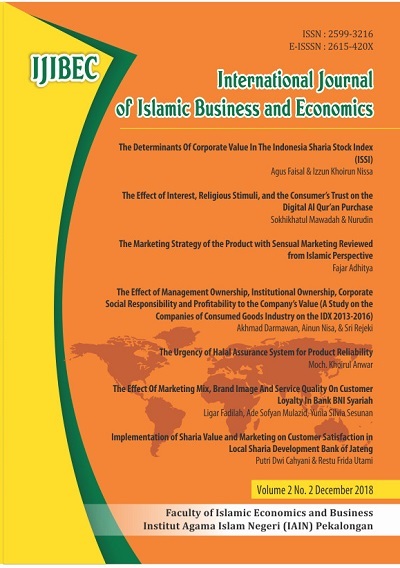 International Journal of Islamic Business and Economics (IJIBEC), [S.l. ], p. 99 - 106, dec. 2018. ISSN 2615-420X. Available at: <http://e-journal.iainpekalongan.ac.id/index.php/IJIBEC/article/view/1261>. Date accessed: 22 apr. 2019. doi: https://doi.org/10.28918/ijibec.v2i2.1261.